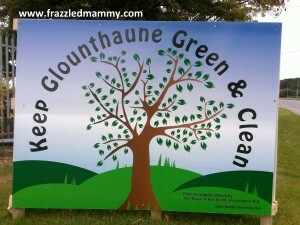 I’m delighted to see the poster I worked on for Glounthaune (Cork) Community Association ‪ and Glounthaune ‪tidy‬ towns to ‘Keep Glounthaune Green & Clean’ is placed on the roadway entering the village. I did this using Adobe Illustrator and it’s based on a winning original artwork for Glounhthaune Tidy Towns by Tom Dwyer and Ben Smith who were in 6th class in Glounthaune National School. Well done boys! This entry was posted in Uncategorized on October 30, 2015 by frazzledmammy.